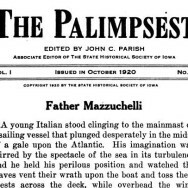 A young Italian stood clinging to the mainmast of a sailing vessel that plunged desperately in the midst of a gale upon the Atlantic. His imagination was stirred by the spectacle of the sea in its turbulence, and he held his perilous position and watched the waves vent their wrath upon the boat and toss their crests across the deck, while overhead the wind howled through the rigging and the thunder crashed in the darkened sky. Wide-eyed and fascinated he gazed at the storm about him, and with the same wide-eyed eagerness he looked forward to the quest upon which he was embarked. Samuel Charles Mazzuchelli was answering a call that had come to him at Rome. Since he was seventeen he had been preparing for the life of a Dominican priest, but when he was about twenty-one and not yet ordained he had heard a man from America tell of the need of preachers and churches on the far western edge of that new country. And with hardly more ado than a trip to Milan to bid his parents farewell, he had set out for the land of possibilities. In France, on a two months sojourn, he had picked up a little knowledge of French, but he spoke no English. He had no companion nor was any one to meet him in New York. He only knew that somehow he was to get to Cincinnati, where he was to be taught English, ordained, and assigned to a mission. And somehow he did get there and began the last round of preparation for his life work. Two years later, in 1830, Mazzuchelli appeared at Mackinac Island in the northern part of the Territory of Michigan. This island in the straits between Lakes Huron and Michigan was one of the posts of the American Fur Company. During the winter it was comparatively quiet, but in the summer when the fur traders accompanied by their boatmen and clerks came in with their loads of furs–the result of a winter’s work upon a hundred rivers and lakes in the northwest–the island swarmed with a motley population of Americans, French, Canadians, half-breeds and Indians. He journeyed on foot, by canoe and on horseback, and in winter on snow-shoes and by sledge. over the deep snows or up and down the frozen rivers. His memoirs read like pages from the Jesuit Relations of a century and a half before. He held services sometimes in the open under the trees, sometimes in lodges made of bark and mats brought and set up for the occasion by the Indian worshippers. He lived at times in the cabins of Indian tribes, eating with them, trying to master their languages, and sleeping upon their mats at night. Nature never ceased to delight him. In his memoirs, in which he always spoke of himself in the third person, he tells of a journey to Arbre-Croche on the shore of Lake Michigan. “Taking advantage of ten Catholic Indians leaving for Arbre-Croche in a bark canoe one evening he crossed the Straits of Mackinac with them and spent the first night in a dense forest under a little tent cheered by a crackling fire close by,–which was supplied with fuel by the company. Who will forget the sweet canticles sung in their own native tongue by the pious oarsmen while crossing the Lake? The starry vault above the calm of the limpid waters, their immensity lost in the western horizon, the pensive stillness of the shores far-off yet barely discernible. all seemed to echo the sweet reverent tones of the simple good Ottawas”. During these five years other priests had come to the Territory of Michigan and the trading posts and Indian villages became accustomed to the sight of the long black mantle of the Dominicans. Mazzuchelli began to think of new fields of labor. In the spring of 1835 he made a trip to Cincinnati by way of St Louis and the Ohio River, and as he went down the valley of the Mississippi he visited for the first time the town of Galena on the Fever River in Illinois, and the little settlement at Dubuque on the west side of the Mississippi. In these two lead mining towns were many Catholics without either church or pastor, and following the visit of Mazzuchelli they petitioned his superiors to allow the priest to give his services exclusively to that section of the frontier. Thus began a new period in his life. His work was now almost entirely among the white settlers of the towns along the Mississippi, but it was none the less a life of ceaseless activity. He became more definitely a church builder. In the town of Dubuque he stirred the people to make subscriptions for a building, he drew up the plans himself, hired the workmen, and laid the corner stone. The church was built from the native rock of the vicinity and under the zealous eye of the priest it grew slowly but steadily to completion. In that same year, 1835, Mazzuchelli began a church at Galena. Here again he was architect and superintendent and it took long months to complete the work. In the meantime he built a little wooden chapel with a confessional on one side of the altar and a closet on the other, six feet by five, in which he slept. He alternated between Galena and Dubuque; and in the latter town while the church was going up he made his home in a little room under the Sanctuary, with unplastered walls and with the bare earth for a floor. Just so he must have been remembered by the inhabitants of many a frontier town–seated upon a stone with the skirts of his mantle tucked up about him, overseeing the work upon a church that owed to him not only the inspiration for its erection but the practical details of its architecture as well. 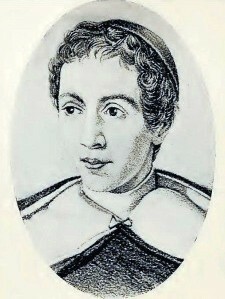 In 1839 the arrival of Bishop Loras to take charge of the newly created Diocese of Dubuque relieved greatly the burden of Mazzuchelli’s work and widened the scope of his energies. Wherever he went, churches sprang up. He made trips up and down the river in every kind of weather and over every kind of road. A little frame church was the result of his work at Potosi, Wisconsin; and at Prairie du Chien he drew plans and superintended the erection of a stone church a hundred feet in length. He carried his religious ministrations to Antoine Le Claire upon the site of Davenport before that town existed. Not many years later, in conjunction with Le Claire, he made arrangements for the building of a brick church in the new town. He had complete charge of the building of the first Catholic church in Burlington, and when it was finished but not yet consecrated he rented it for one session to the Legislative Council of the Territory of Iowa and was paid three hundred dollars for its use–sufficient to finish paying the debt incurred in its construction. When Iowa City became the capital of the Territory of Iowa and the government offered free sites in the town for churches if they were built within a given time, the energetic priest hurried over to the inland town and made preparations for building a church. And when Bishop Loras came in 1841 to lay the corner stone, Mazzuchelli, standing on a mound of earth thrown up by the excavators, gave the address of the occasion. So this pioneer priest passed from town to town, celebrating mass, visiting the sick and everywhere leaving brick and stone monuments to his energy. Churches at his inspiration raised their crosses to the sky at Maquoketa and Bellevue and Bloomington (now Muscatine) in the Territory of Iowa and at Shullsburg and Sinsinawa in the Territory of Wisconsin. One who knew him well credits twenty churches to this far wandering priest. Father Mazzuchelli took a keen interest in things political as well as religious. In 1836 he officiated as chaplain at the first Fourth of July celebration in the town of Dubuque. In the fall of that same year he responded to an invitation to open with prayer the meeting of the Territorial Legislature of Wisconsin at Belmont; and he never ceased to praise the wisdom of the framers of the Federal Constitution for allowing religion to exist free from the trammels of the political state. In February of 1843, having heard much of the sect of Mormons he determined to visit in person their prophet, Joseph Smith, at Nauvoo. Being then at Burlington he journeyed to Fort Madison and from there passed down the river on the ice and across to the Mormon town on the Illinois side, where the prophet talked to him at length but unconvincingly of the many times he had conversed with God in person, of the revelations he had received from St. Paul, and of the golden Book of Mormon whose whereabouts an angel had revealed to hi. A few weeks later he started on a long journey back to Italy, While there, largely to enlist funds for his missionary enterprises, he wrote and published in Italian his Memoirs dealing with the fifteen years of his life in America. With characteristic modesty he invariably used the third person speaking of himself as the Missionary or the Priest, and nowhere in the book, not even upon the title page, does his name appear. In 1915, over fifty years after his death, the volume was re-published in an English translation. Mazzuchelli did not stay long in Italy, but returned to devote nearly a score of years to additional service in the Upper Mississippi Valley. His later life was spent largely in southwestern Wisconsin, and since there were many priests now in the field, his labors were less arduous. But he passed down the years with busy feet, founding schools and colleges, teaching and preaching and raising new buildings, visiting the sick and dying, and now and then, with unflagging devotion, attending the victims of an epidemic, like that of 1850 when the ravages of cholera swept over southwestern Wisconsin. A man of wide interests and versatile talents was Father Mazzuchelli. His ability as an architect has been mentioned. Aside from the building of churches, Archbishop Ireland credits him with having drawn the plans of the first court house in Galena, and, although he himself makes no mention of it in his writings, he is said to have designed the Old Stone Capitol at Iowa City [this is not so; however Father Mazzuchelli did design a spiral staircase in the Old Stone Capitol]. The carving of a beautiful altar in a chapel in Dubuque is attributed to him by Archbishop Ireland. If, as seems probable, the maps of the Mississippi Valley and Great Lake region which accompany his Memoirs and the frontispiece depicting the habitation and family of a Indian, are his, he must have had unusual skill with the pen. His memoirs themselves show a command of language, a genuine love of the beautiful in nature and life, and an intense patriotism for his adopted country. Ardent but gentle, inspiring yet practical, this energetic Dominican played an unusual part in the development of the West. His life was, throughout, one of service but perhaps the keynote lies in those early years of wide and weary travel and church building. Here he was in very truth a pioneer; and wherever canoe or sled or his own tireless feet carried him, men of varying and of mixed races of all creeds and of no creed were better for the sight of his kindly face, the sound of his cheering words, and the unceasing labors of his hand and mind.